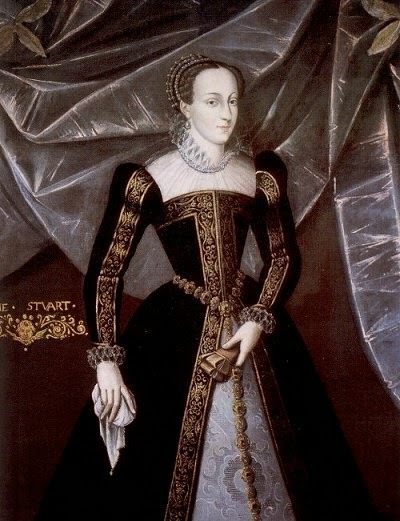 "In my end is my beginning" - the motto of Mary, Queen Scots, Catholic Queen of Scotland who lost her throne and was beheaded by her cousin, Elizabeth I of England, in the sixteenth century. A lesson that it is not only in our own time that the enmeshments of politics can lead to events and acts of violence that maybe neither party would have desired. Yet there is another lesson there that has something to say to us in our generation and especially at this season, as one year ends and another begins. Whether one sympathizes with Mary of Scotland or not, she was undoubtedly a human being who sinned and made mistakes, but who also held devoutly to her faith. Her motto is something to ponder. During the Christmas season have you ever felt a sense of material excess that didn't seem to be what Christmas was about? Did someone else seem to take the way Christmas was celebrated out of your hands and arrange things in a way you wouldn't? How did you respond? We all have our ideas about how things should be (and maybe our way is best!) but is there a deeper level at which we can handle these questions? Can we let go of our own preferences? Even when they are good ones? Can we open ourselves sufficiently to let the Holy Spirit help us see that these superficial things don't matter? That they matter so little that, well, it would nice to get rid of them, but they're so unimportant, it doesn't matter if we can't. Can we free ourselves so we don't spend our energy on these minor irritants, but let them go so that we are not distracted within ourselves and can focus on what really matters - Christ come into the world? "In my end is my beginning." Let me put an end to myself and my desires and preferences as being significant. Let me see that by doing so, I can begin a richer life in Christ. As 2014 ends, Lord, help me to put an end to caring about small things and let me begin the New Year by opening fully myself to the glorious and eternal mystery that is You. Advent reminds us of Mary’s quiet waiting in a time of unknowing. The wonder of pregnancy and birth rarely leaves us unmoved. Like all mothers, Mary likely went about doing her ordinary tasks with an ever growing awareness of the movements of the child within her. And during times of stillness, she must have been amazed at this child sent by God to be nurtured within her. Her early response to the Angel Gabriel’s message, however, quickly evolved into acknowledging solidarity with another pregnant woman, her cousin Elizabeth. Her bold choice to move beyond her own pregnant condition to create room in her life for someone in need, lets us know again what it means to respond to ever-present God-ness. In the stillness of her journey she moved forward, one step at a time. In our daily darkness of unknowing, every response to hidden-Godness may allow small incarnations to again be manifest. Sometimes the invitations arise in situations and persons we may prefer to pass by. Can it be, that within a deep breath of stillness, one breath at a time, we can actually awaken to a wider range of incarnating-responses? It may be, that inviting ourselves to choose these brief moments, we may find ourselves in solidarity with Mary’s step by step waiting and incarnating. According to Bede Griffiths, stillness can be amazingly transformative for ourselves and all around us. Stillness within one individual can affect society beyond measure. This year, 2014, has been designated the “Year of the Pope.” Media Source, 2014, published a lovely book on highlights in the history of the papacy. It speaks of Pope Francis in these words: “In 2014 Pope Francis will continue his busy schedule, changing minds and winning hearts all over the world. Taking charge of a church from which many were distancing themselves, Francis has begun to show the world what strong, open-minded leadership can do. With only 12 months under his belt, he’s truly just getting started.” There is no doubt that Pope Francis speaks his mind. About our world economic system, he says: “It is not good! It’s a system that in order to survive must make war, as great empires have always done. But now, since you cannot have a Third World War, you have regional wars. And what does this mean? That arms are made and sold and in this way the idolatrous economies, the great world economies that sacrifice man at the feet of the idol of money, obviously keep their balance sheets in the black.” (The Visitor [St Cloud, Minn., diocesan newspaper], 6/20/2014). He clearly speaks his mind. Can we hear him? He also says: “Globalization’s failings are not only material but cultural since it cancels differences.” (Ibid.) Pope Francis calls for an economic system that “preserves each person’s particularity, richness, and identity.” (Ibid.) A very timely message, I would wager! If, throughout history, the Church has changed so much, I do not see why we should not adapt it to the culture of our times. Not everyone present belongs to the Catholic faith and others do not believe. I respect the conscience of each one of you, knowing that each one of you is a child of God. May God bless you! As we move into December, the rhythm of abundant darkness and longing for welcoming light is upon us. This pattern immediately brings to mind a recent, true story shared on the occasion of celebrating the 100th anniversary of the dedication of our monastic chapel. S. Michaela Hedican, Prioress at Saint Benedict’s Monastery, St. Joseph, Minn., told the story of a 300 year old church nestled in a rural area just outside Geneva, Switzerland. 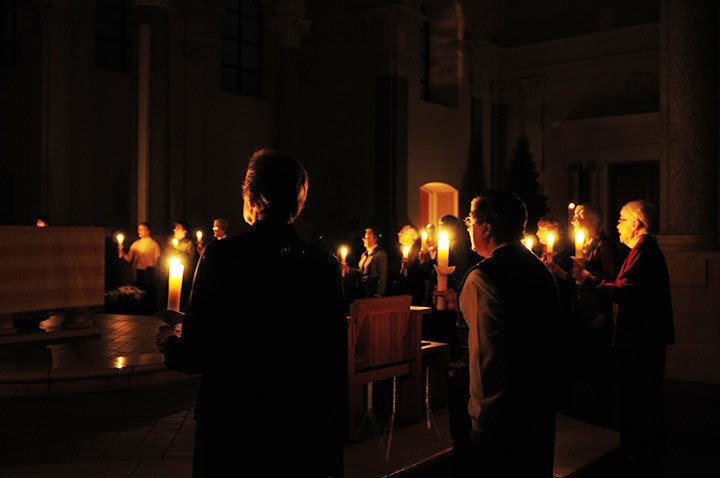 At that time the congregation could not afford lights for the evening service, nor could they afford candles, so a tradition began that when everyone would come to church, they each brought their own light. A visitor came to church one evening and the church was completely dark. The visitor was about to leave and as she was walking down the steps of the church she saw in the distance one light coming along a path. Then from another direction another light, then from another direction yet another light and another and another, and step by step, one by one, from all around, people kept coming with their lights. Maybe that invitation for living in the light these dark wintery days is actually that simple. Tell me your story and I’ll remember it forever. We were mesmerized by this beautiful, pregnant woman who, in her sophomore year in college, had chosen a life of meaning rather than a life of comfort. Her story started with her having watched the horrors of 9/11, watched the horrendous killing of people-- who looked like herself-- by Americans who did not know how to stop their hatred of the “perpetrators” in that destructive sequence of events. She felt the urgency of choice within herself: would she go to help the victims? Or would she choose to stay in her comfort zone? This would-be journalist, age 20, chose to leave her home, drive across country to New York, where the scenes and stories of violence broke her heart and broke it open so that she simply had to share the sorrow of those in unutterable pain. Shared sorrow was her choice. . . and in that choice, she found her life’s meaning. In her life’s work, she tells stories, one after another of other courageous women and men who, like herself, have also found their meaning within the choices they have made. “Choice,” she says, “is a privilege and, if we are opting for meaning, we need to make good choices many times every day. The heart is a muscle and we keep exercising it. With this practice and the support of community, we will find the courage to make the bigger decision.” There was no hesitancy in her as she witnessed to the cost and dangers in making the decision to choose a life of meaning over a life of comfort. “It is possible to do something but the work of justice is hard: higher than the truth is living out the truth,” she says. Having chosen a life of meaning over a life of choice, Valarie Kaur is able to “see no strangers now because WE ARE ALL ONE.” Thank you, Valarie!